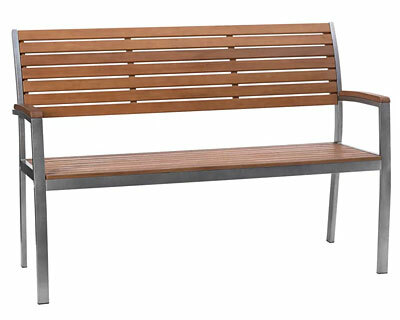 Add a contemporary hint to your backyard or garden with the Arboria Wooden Fusion Bench. This unit adds a comfortable seating area to your outdoor living space, while meshing manmade materials with natural ones for a fantastic garden addition. Steel legs and arms bring a bold look to this item, and perfectly support the 49.5" long, wooden seat. A graphite colored, powder coated finish on these side panels contrasts the brown of the seat and back, while protecting the steel from the elements. Both the frame and back of the bench angle slightly outward for a natural position, and support planks behind this piece ensure a lasting item. The slatted design of the seat and its back create a classic look, and the hardwood construction remains durable and beautiful for many seasons. Steel legs rest on a level surface and ensure a sturdy support, and the item will look great in your home, garden, or on your patio for a truly versatile bench. Enjoy sitting in your garden on this Wooden Fusion Bench. Assembly required.